Stems: Erect, slender, often much branched, 4-angled, grooved, glabrous below to glandular pubescent above. Leaves: Opposite, ovate to lanceolate, 3 to 8 inches long, 1.1 to 3.6 inches wide; margins sharply toothed; tip tapering to point; stalk slender, 3/5 to 3 inches long. Inflorescences: Panicle, somewhat pyramidal, 2 to 6 inches wide, nearly leafless, terminal. Flowers: Calyx deeply 5-parted, about .1 inch long; segments 5, rounded, about as long as tube; corolla strongly 2-lipped, 1/5 to 2/5 inch long, reddish-brown inside, pale green outside; upper lip 2-lobed, flat, erect; lower lip shorter with vertical lateral lobes; fertile stamens 4; sterile stamen club-shaped, longer than wide, brown or brownish-purple. 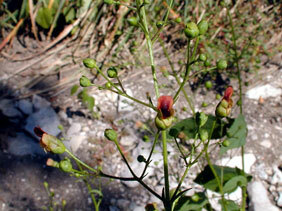 Fruits: Capsule, broadly egg-shaped or nearly spherical, 1/6 to 1/4 inch long, shiny brown; seeds numerous. Habitat: Woods, thickets, and moist, shaded ravines.